Julie Huntington and Samantha Riley from HAODS (Henley Amateur Operatic & Dramatic Society) are hoping to repeat the success of last year at the Henley Drama Festival which saw the society win overall winner and Best Actress and other awards. The will be performing Effie’s Burning which was written for the now defunct Lunchtime Season at the Library Theatre in Manchester on Friday 4 May at the Kenton Theatre. It was an excellent concept, which allowed four or five new writers the chance of a real professional production. This one act play had an illustrious cast in Paula Tilbrook (Betty in Emmerdale) as Effie and Brigit Forsyth (Thelma in Whatever Happened to the Likely Lads) as Dr Kovacs. This powerful play will have you weeping and cheering, but most of all, holding your breath as to what is coming next. Julie Huntington (Effie) and Samantha Riley (Dr Kovacs) have been deep in rehearsals for this production for just 5 weeks. With Sam also performing in Gypsy, and Julie having just finished directing Allo Allo, they have tried to get together as often as possible The themes are powerful: relationships, discrimination, neglect and power. 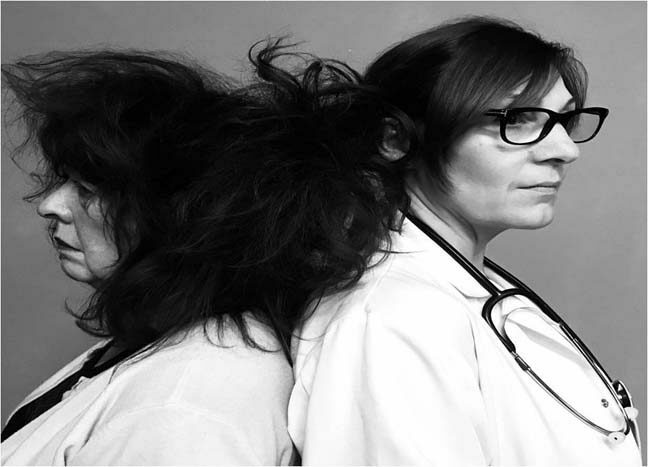 The play sees Dr Kovacs (Samantha Riley), a medical resident in a burns hospital, becomes interested in Effie Palmer, (Julie Huntington) a retarded 64-year-old patient, accused of burning down the care Home she was in. Effie is reticent about how she got burned, or even how she became institutionalised in the first place. As Kovacs hones in on Effie’s past and their friendship develops, Effie starts to reveal the secrets kept from her by her own mind but released during nightmares which trigger controversial and challenging thoughts in Dr Kovacs. Their friendship serves to empower both women into securing their futures. The Drama Festival is a wonderful showcase for societies to try something different and has 3 one-act plays each evening (2-5 May). Please come and support HAODS and the festival.